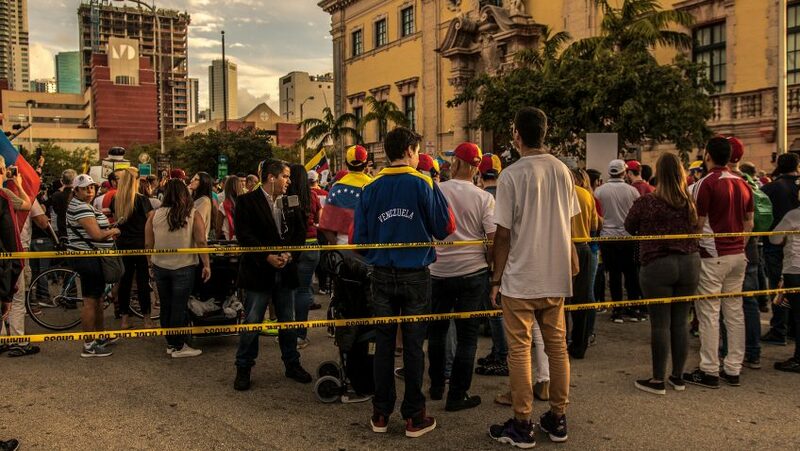 MIAMI, FL – April 20: Anti-Maduro protestors pose for a photo at a rally for Venezuela on Biscayne Boulevard in downtown Miami on April 20, 2017 | PHOTO CREDIT: Raul Diego for deepcitychronicles ©2017 Deep City Chronicles. All Rights Reserved. 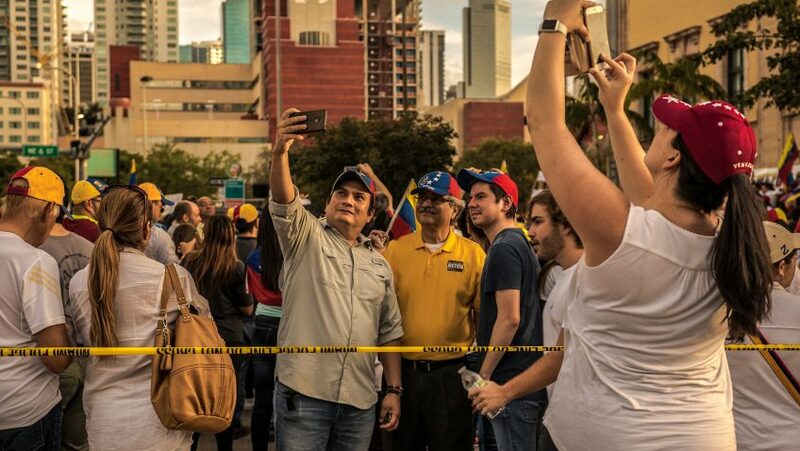 MIAMI, FL – April 20: Anti-Maduro protestor pose for a selfie during a rally for Venezuela on Biscayne Boulevard in downtown Miami on April 20, 2017 | PHOTO CREDIT: Raul Diego for deepcitychronicles ©2017 Deep City Chronicles. All Rights Reserved. MIAMI, FL – April 20: A group of protestors carry a giant Venezuelan flag a rally for Venezuela in downtown Miami on April 20, 2017 | PHOTO CREDIT: Raul Diego for deepcitychronicles ©2017 Deep City Chronicles. All Rights Reserved. 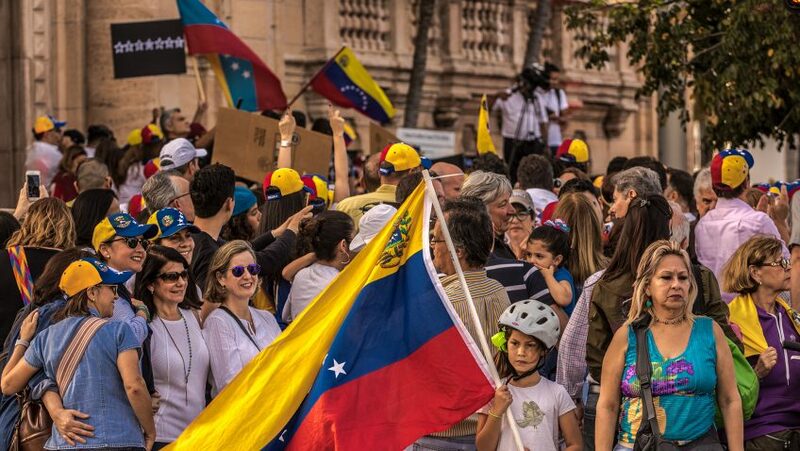 MIAMI, FL – April 20: A group of protestors arrive at a rally for Venezuela in downtown Miami carrying a giant Venezuelan flag on April 20, 2017 | PHOTO CREDIT: Raul Diego for deepcitychronicles ©2017 Deep City Chronicles. All Rights Reserved. MIAMI, FL – April 20: Anti-Maduro protestors pose for a photo with their sign reading “No More Dictatorship” during a rally for Venezuela in downtown Miami on April 20, 2017 | PHOTO CREDIT: Raul Diego for deepcitychronicles ©2017 Deep City Chronicles. All Rights Reserved. 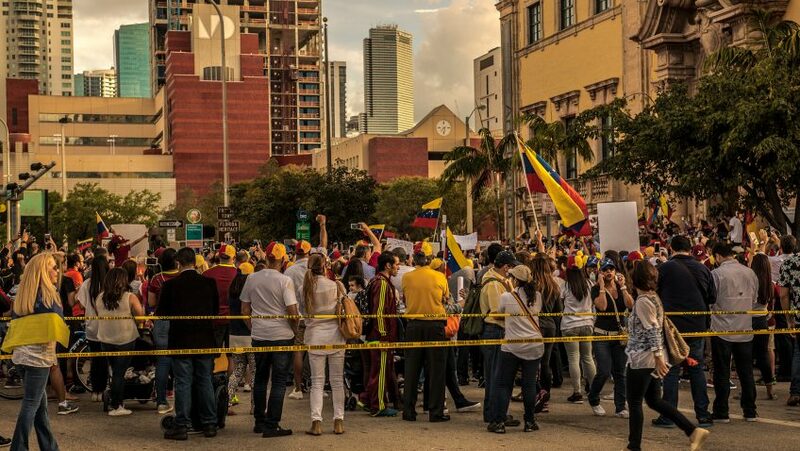 MIAMI, FL – April 20: Anti-Maduro protestors at a rally for Venezuela in front of the Freedom Tower on Biscayne Boulevard in downtown Miami on April 20, 2017 | PHOTO CREDIT: Raul Diego for deepcitychronicles ©2017 Deep City Chronicles. All Rights Reserved. MIAMI, FL – April 20: Man walks with a Venezuelan flag at a rally for Venezuela in downtown Miami on April 20, 2017 | PHOTO CREDIT: Raul Diego for deepcitychronicles ©2017 Deep City Chronicles. All Rights Reserved. 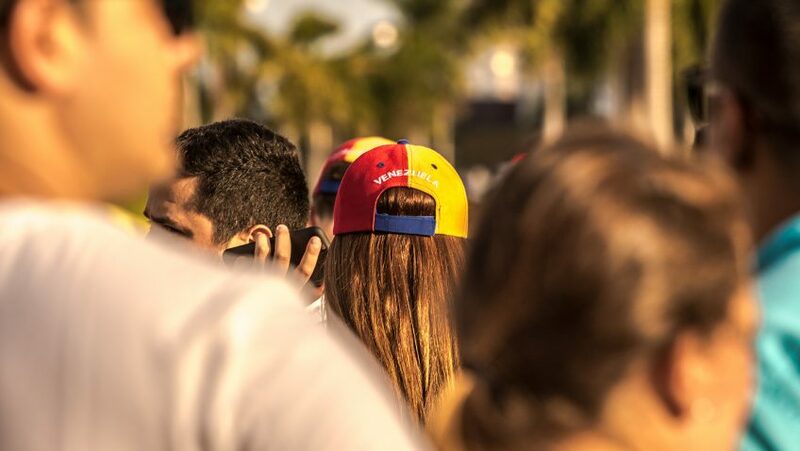 MIAMI, FL – April 20: Anti-Maduro protestors pose for selfies during a rally for Venezuela on Biscayne Boulevard in downtown Miami on April 20, 2017 | PHOTO CREDIT: Raul Diego for deepcitychronicles ©2017 Deep City Chronicles. All Rights Reserved. MIAMI, FL – April 20: Venezuelan media covers rally for Venezuela in downtown Miami on April 20, 2017 | PHOTO CREDIT: Raul Diego for deepcitychronicles ©2017 Deep City Chronicles. All Rights Reserved. MIAMI, FL – April 20: Man stands with a Venezuelan flag at a rally for Venezuela in downtown Miami on April 20, 2017 | PHOTO CREDIT: Raul Diego for deepcitychronicles ©2017 Deep City Chronicles. All Rights Reserved. MIAMI, FL – April 20: Man stands with child in sling at rally for Venezuela in downtown Miami on April 20, 2017 | PHOTO CREDIT: Raul Diego for deepcitychronicles ©2017 Deep City Chronicles. All Rights Reserved. 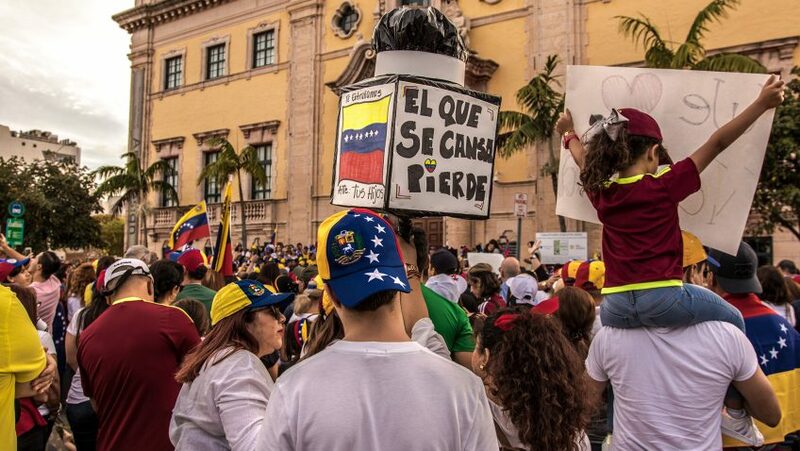 MIAMI, FL – April 20: Anti-Maduro protestors hold up signs at a rally for Venezuela in front of the Freedom Tower on Biscayne Boulevard in downtown Miami on April 20, 2017 | PHOTO CREDIT: Raul Diego for deepcitychronicles ©2017 Deep City Chronicles. All Rights Reserved. 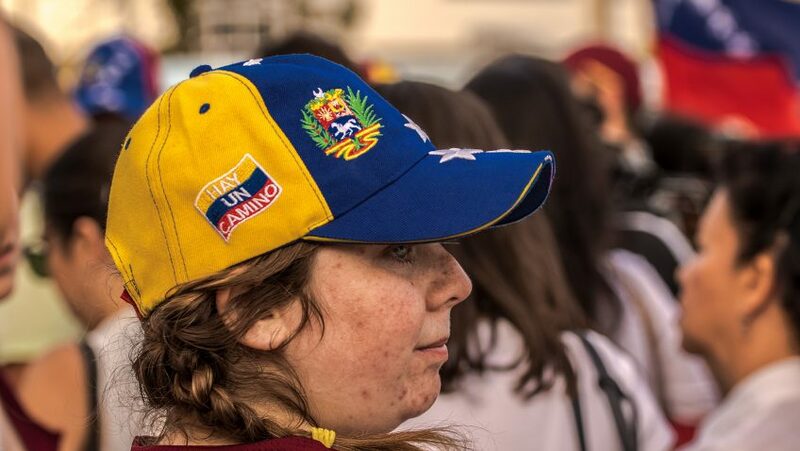 MIAMI, FL – April 20: Anti-Maduro protestor at a rally for Venezuela in front of the Freedom Tower on Biscayne Boulevard in downtown Miami on April 20, 2017 | PHOTO CREDIT: Raul Diego for deepcitychronicles ©2017 Deep City Chronicles. All Rights Reserved. MIAMI, FL – April 20: Father props up son on his shoulders at a rally for Venezuela in front of the Freedom Tower on Biscayne Boulevard in downtown Miami on April 20, 2017 | PHOTO CREDIT: Raul Diego for deepcitychronicles ©2017 Deep City Chronicles. All Rights Reserved. 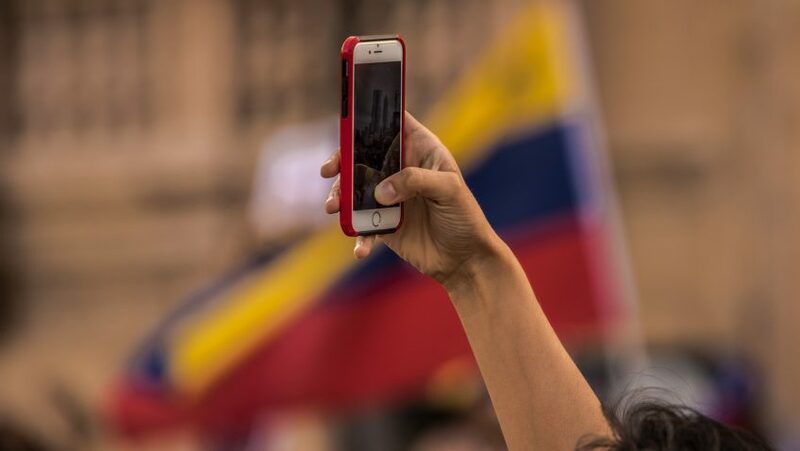 MIAMI, FL – April 20: Anti-Maduro protestor takes a picture with a cell phone at a rally for Venezuela in downtown Miami on April 20, 2017 | PHOTO CREDIT: Raul Diego for deepcitychronicles ©2017 Deep City Chronicles. All Rights Reserved. 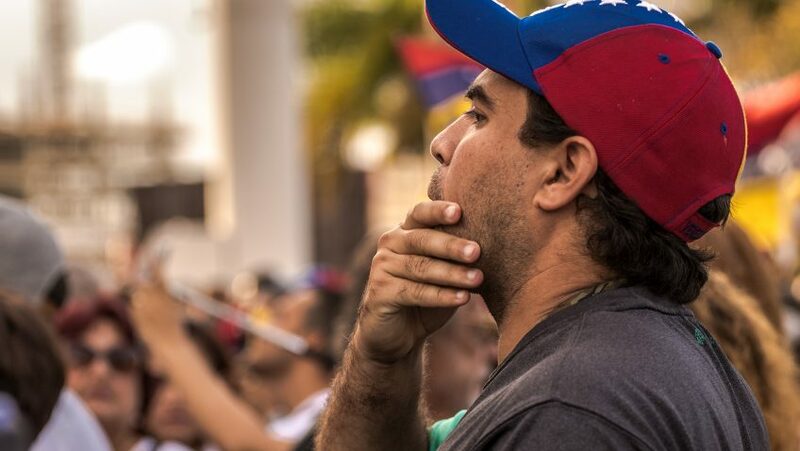 MIAMI, FL – April 20: Profile of anti-Maduro protestor at a rally for Venezuela in front of the Freedom Tower on Biscayne Boulevard in downtown Miami on April 20, 2017 | PHOTO CREDIT: Raul Diego for deepcitychronicles ©2017 Deep City Chronicles. All Rights Reserved. 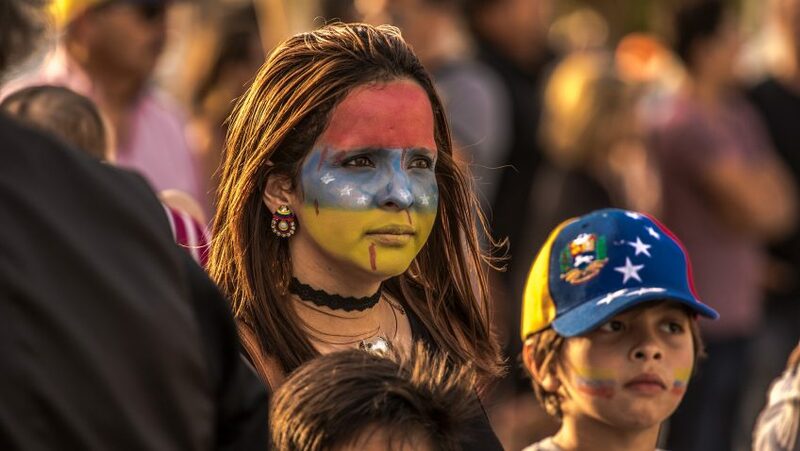 MIAMI, FL – April 20: Young mother arrives with her face painted as Venezuelan flag and blood drops at rally for Venezuela in downtown Miami on April 20, 2017 | PHOTO CREDIT: Raul Diego for deepcitychronicles ©2017 Deep City Chronicles. All Rights Reserved. 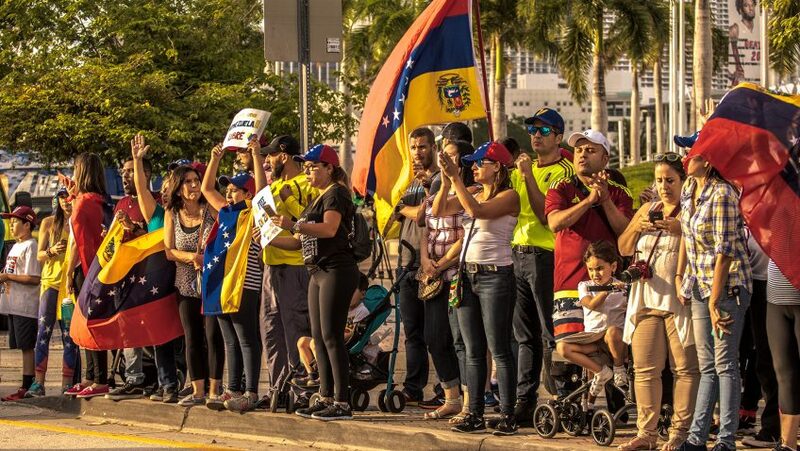 MIAMI, FL – April 20: Anti-Maduro protestors at a rally for Venezuela on Biscayne Boulevard in downtown Miami on April 20, 2017 | PHOTO CREDIT: Raul Diego for deepcitychronicles ©2017 Deep City Chronicles. All Rights Reserved. 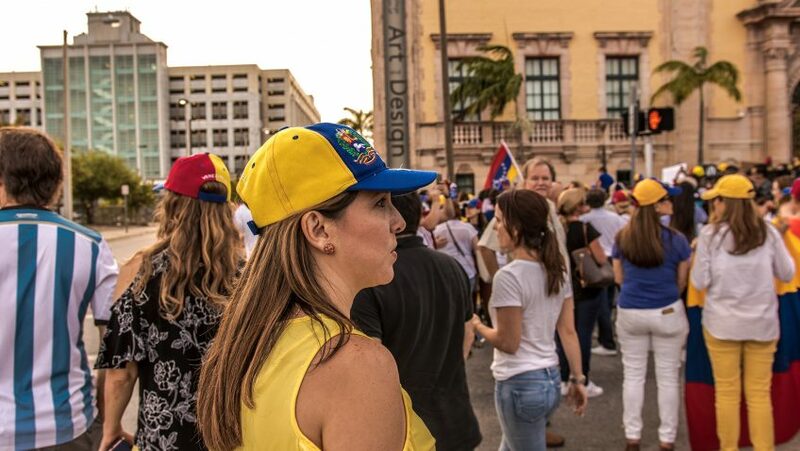 MIAMI, FL – April 20: Anti-Maduro protestor at a rally for Venezuela in downtown Miami on April 20, 2017 | PHOTO CREDIT: Raul Diego for deepcitychronicles ©2017 Deep City Chronicles. All Rights Reserved. MIAMI, FL – April 20: Capriles supporter holds his daughter on his shoulders at a rally for Venezuela in downtown Miami on April 20, 2017 | PHOTO CREDIT: Raul Diego for deepcitychronicles ©2017 Deep City Chronicles. All Rights Reserved. MIAMI, FL – April 20: A young boy holds a sign that reads: “I want a free Venezuela” sitting on his father’s shoulders at a rally for Venezuela in downtown Miami on April 20, 2017 | PHOTO CREDIT: Raul Diego for deepcitychronicles ©2017 Deep City Chronicles. All Rights Reserved. 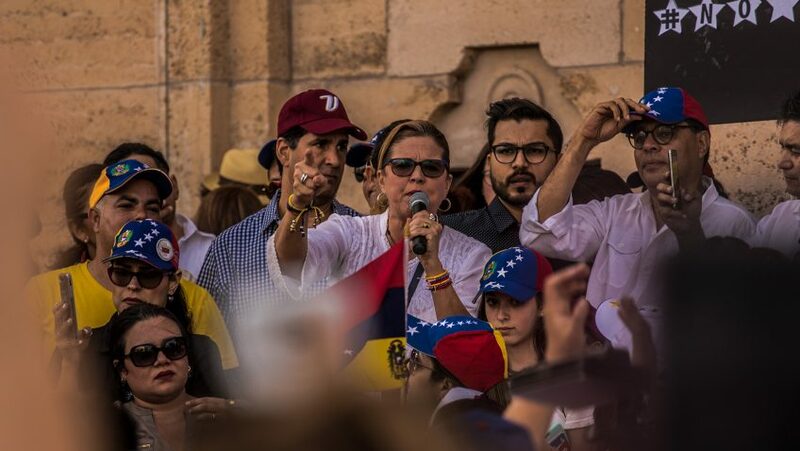 MIAMI, FL – April 20: Activists address the crowd at a rally for Venezuela on the steps of the Freedom Tower in downtown Miami on April 20, 2017 | PHOTO CREDIT: Raul Diego for deepcitychronicles ©2017 Deep City Chronicles. All Rights Reserved. 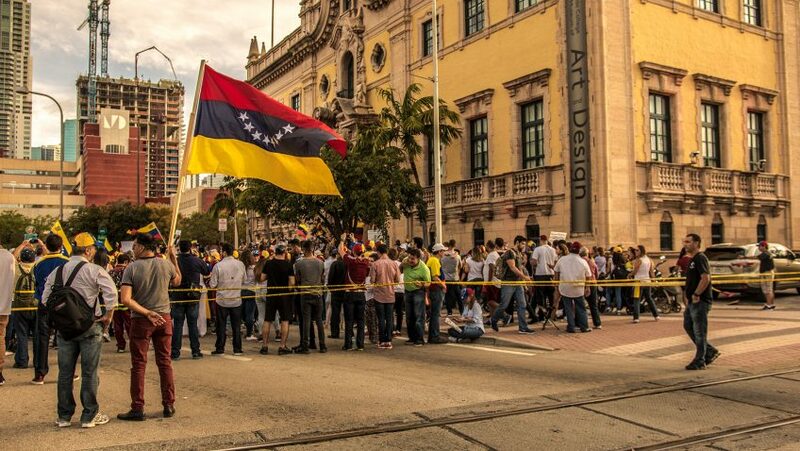 MIAMI, FL – April 20: Anti-Maduro protestors at a rally for Venezuela in downtown Miami on April 20, 2017 | PHOTO CREDIT: Raul Diego for deepcitychronicles ©2017 Deep City Chronicles. All Rights Reserved. MIAMI, FL – April 20: Anti-Maduro protestor walks on train tracks as she makes her way to the rally for Venezuela in downtown Miami on April 20, 2017 | PHOTO CREDIT: Raul Diego for deepcitychronicles ©2017 Deep City Chronicles. All Rights Reserved.